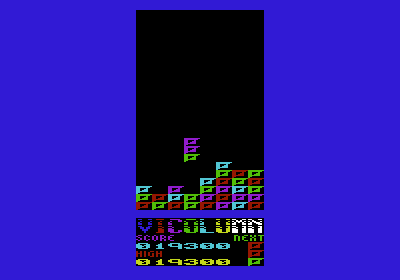 For those who need an introduction to the concept behind ViColumn, it's an action-puzzle game where the player must guide a group of three coloured blocks down into an on-screen well until they settle - if a column or row forms with three or more blocks of the same colour, they're removed from the play area and everything shuffles down to make more room. The action slowly gets faster each time blocks are removed, so to go for those big scores its best to try building four and five brick rows and causing "chain reactions" where possible. Trivia: The shape of the game was originally inspired by some experimentation into how the VIC 20 can reorganise it's display. This game was written for an unexpanded machine, please disable all RAM expansions before running ViColumn.